Need to keep track of or report your mileage? 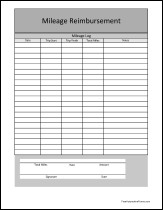 We've got the forms here that can help you keep an accurate record. There are 20 forms in the 'Mileage Forms' category, available on 3 pages. (You are viewing page 3.) Forms 19 through 20 are on this page, shown below. Click one of the forms below to discover more information.